The Encina First Class 50th class reunion will be a simple affair at Maxi’s at the DoubleTree Hotel on Friday, September 9th, 2011 starting at 6:00 PM. We will require no reservations and there’s no charge to attend this gathering. We would appreciate your letting us know if you will attend and how many will be in your party so we know how to order. Hors d’oeuvres will be served and there will be a no-host bar. Photos will be available for purchase of any group you assemble or just a post-graduation portrait of yourself. The DoubleTree Hotel located at 2001 Point West Way (916 929 8855) in Sacramento is off of Arden Way, just east of the Capital City Freeway (Business 80) across from Arden Fair Mall. They are offering us a rate for overnight guests of $89.00 for their newly refurbished rooms with the code CAT at the time of booking. They have reduced the secured parking fee to $3.00 for the event and there is a parking fee of $6.00 per 24 hrs for our group. Call 916-929-8855 for reservations as soon as possible if you will be staying overnight at the hotel. In the interest of safety, we encourage you to stay overnight even if you live locally. This is a great opportunity to get with your old friends for other fun events the balance of the weekend. If you have any contact with classmates that attended Encina within our class, graduation not required, please forward this information even if you think they’ve been notified. Thank you. We’ll be looking forward to seeing you. 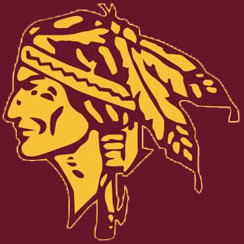 As you know, the 11th Annual Encina Alumni Challenge is coming Friday, April 29, 2011. 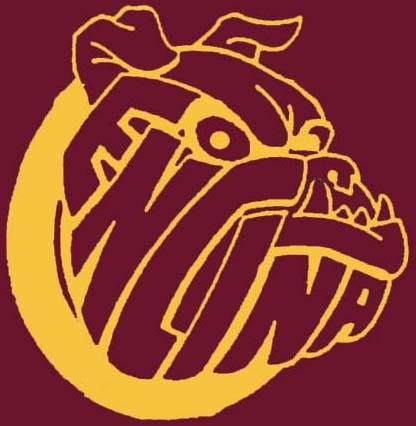 This year we'd like to honor the Class of '61 and celebrate 50 years of Encina graduates. We've begun planning for a Golden Anniversary party and would like your help in getting the word out and getting as many of Encina's FIRST class to the Alumni Challenge. We also hope to bring back faculty who were Encina's first teachers. At this time we're planning to have pictures of '61 alum and, decorations in the cafeteria celebrating the Class of '61 and a special birthday cake (or several!) for all Alumni Challenge attendees. 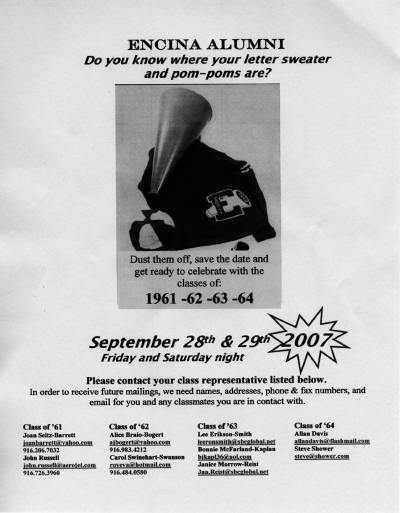 In a few days Harlan will be sending out the Alumni Challenge announcement, but I wanted you to be aware of our plans for celebration and hope you can help get the word out and get the Class of '61 back to Encina! More information will follow, but please feel free to contact your classmates and get the word out. Feel free to email or call if you have ideas for making this celebration even better. We are planning a combined 2007 reunion for all of us. On Friday, September 28, 2007 there will be a no host cocktail party for alumni only at Piatti's outdoo courtyard, Fair Oaks Blvd., Sacto., California, followed by a gala evening bufftet at Del Paso Country Club, Marconi Ave., Sacramento, California, for alumni, spouses, partners/guests the following night, Saturday, September 29, 2007. SAVE THE DATES!!!!!! More information will follow as plans are finalized. In the meantime, please contact one of your class contact persons noted below to let us know of your interest in attending and to provide your current contact info (full name, including maiden name if married, address, phone, fax, email for future mailings about the big event. Also, if you are in touch with any classmates from any of our classes provide their info as well as we want to find as many of us as possible. Our classes rocked back then and we intend to rock again with your help. The 1961 Class Directory lists contact information for your classmates. Please submit your contact information. John Kirsten Landgraf passed away this April at the age of 74 surrounded by his wife, children, and surviving sister, after a struggle with cancer. John was a painter and master ceramicist who devoted his professional life to art education. John was born to John and Helen (Stewart) Landgraf in 1942 while his father was stationed at Williams Field in Arizona. The family returned to Sacramento after the war and ran a detective agency, but art was their real passion. John was surrounded by art and working artists his whole life. He graduated from Encina High School and spent freshman year at the California College of Arts and Crafts in Oakland. He then attended Sacramento State College, where he played football and studied art and psychology. After college John served in the Coast Guard, patrolling the Aleutian Islands which inspired an abiding love for the sea. After leaving the service he married Ann (Tune) Landgraf in 1968 and worked for a year as the art teacher and football coach at Exeter High School in Exeter, CA, where his first child, Jago, was born. For John art was inseparable from all the other components of his life. Over the years he held fellowships and artist-in-residence positions in public schools in Sacramento, Yolo, and Amador Counties and taught art at the Sacramento and Davis Waldorf Schools. John shared his own joyful approach to creating beauty - with the emphasis on creating and doing - with thousands of children. He also created the visual arts program for the Sierra Music and Art Institute and was a board member for many years. Amador County was central to his family life and personal aesthetic. His grandparents John and Hazel (Dillard) Stewart purchased a cabin in River Pines in 1935, and John’s childhood was spent hunting, fishing and exploring the California foothills, often on painting expeditions with his mother. Swimming in the Cosumnes River was one of his great joys and few places gave him as much delight as the family property along Sutter Creek. John was predeceased by his parents and his eldest sister, Christine, who was tragically taken by cancer in 1973. John is survived by his wife, Ann, his daughter, Jago, his son, John, his sister, Cathy Landgraf, and his granddaughter, Kalliope. The family founded the Christine and Helen S. Landgraf Memorial Research Fund at UC Davis in 1973, which makes annual grants to cancer researchers. The Fund is supported by the Amador Cancer Research Foundation and the family requests donations can be made in his name in lieu of flowers to: ACRF, PO Box 36, River Pines, CA 95675. Born on October 20, 1943 in Sacramento, CA, Wayne passed away peacefully on Wednesday, October 12, 2016 at the age of 72. Wayne was a loving husband, father, and friend to those who knew him. He is survived by his wife Stephanie, son Scott, daughters Kerri (Aaron) and Kelly (Graham), and grandchildren, Cayden, Samantha, Sierra, and Aubrey. He now spends his time hugging and kissing his granddaughter Riley. Wayne graduated from Encina High School and joined the Air Force where he served in the Vietnam War. After the war he relocated to Los Angeles where he met his wife Stephanie and joined the Los Angeles Police Department. Wayne served for 26 years and retired as a Sergeant in 1993. After his retirement, Wayne and his family moved to Sacramento where they lived in his childhood home and supported his father Henry during his final years. Wayne made the most out of his retirement by enjoying his family and camping with them as often as possible. Teaching the grandkids how to fish was one of his favorite things to do. He was always willing to share his knowledge, wisdom, or a great story. We love and miss you, XOXO. Published in The Sacramento Bee on Nov. 4, 2016. Lynda M. Nehr, born 3/10/1943, passed away in Afton, WY on 10/19/2016. Lynda was predeceased by her parents, Harold and Betty Smith, sister Sharon Smith Zeka, and niece Jennifer Zeka. Lynda graduated from Encina High School in 1961 and attended Sacramento State before becoming a Peace Corps volunteer in 1962. She spent two years on the island of Mindanao in the Philippines. During part of her professional life, Lynda served as the personal secretary to the then Lieutenant Governor of California (under Ronald Reagan) Edwin Reinecke, and also worked for the CA Dept. of Forestry. Lynda enjoyed horseback riding, the outdoors, floral design, and genealogy and her pets, horses, dogs, and cats who meant the world to her. She is survived by her sister Marsha Roggero; nieces Gina Bartok (Bill) and Angie Phillips (Troy); great nieces Breanne Bartok, Jordan Phillips, and Alexys Bartok; and great nephew Stephen Phillips, as well as other family members. Services were held on Tuesday, 10/25/16 in Afton, WY. Lynda requested any remembrances be in the form of a donation to your favorite animal charity or UC Davis Animal Hospital. Born in San Diego on 10/27/43 and tragically taken in an accident at his home in Folsom on 7/12/13, he was preceded in death by his parents and brother, Sidney. He is survived by his beloved and heart-broken wife of 25 years, Kathy (Bussjaeger-Robinson), his son David Cunningham, daughter Gudrun Cunningham, step-son Marek Robinson and wife Tori, their two precious girls Stella and Zoe Robinson (who adored their Grandpa), as well as his favorite cat, Frankie. A UCD graduate, Alan was an engineer for the Sacramento County Traffic Department for over 30 years. After he retired, he and his wife had two wonderful years of traveling throughout Europe and Asia. He was loved by his co-workers, friends, extended and 'adopted' family members. Described as 'the nicest man I have ever known,' 'a man of integrity,' 'a humble, gentle spirit,' he was always the first to help anyone in need. Although not a member of an organized religion, he was deeply spiritual and representative of all that God chose him to be. Alan had a tremendous sense of humor and always had a twinkle in his eye. He had a deep appreciation for independent and foreign films, and music of all kinds. On any weekend, he could be found hanging out in old Levis, or dressed up going to the opera. He'd cry in sad movies and would get angry when watching sports. He volunteered for Habitat for Humanity, Lions Club, bartended at the Sacramento Jazz festival for years, ushered at the Sacramento Theater Company, the Mendocino Theater Company, and most recently at the Three Stages in Folsom. Services will be Saturday, August 10, 2013 at 3:00 pm at St. Mark's United Methodist Church, 2391 St Marks Way, Sacramento 95864. Reception will follow immediately afterwards at a friend's home. We request NO flowers please, but instead, a donation in his name to The Hunger Project. Published in The Sacramento Bee on July 21, 2013. Born 6/30/43 in Santa Ana Ca. Passed away 3/9/13 in Orangevale CA. Survived by her loving husband of 50 years Millard, loving sons Neil, Eric (Amie), grandson Kevin, siblings Florence (Harvey) and Lawrence (Linda). Preceded in death by parents James and Florence Rockenbaugh, brothers James Jr. and Raymond. In between running her own hair salon and cleaning business, she volunteered at her son's grammar school and was scorekeeper and team mom for their Orangevale pony baseball teams. She loved camping, gardening, crafting, and watching NASCAR and her favorite driver Jeff Gordon. A celebration of her life will be held at the Brolin home, for family and friends, on Saturday, 4/20/13, from 1pm to 4pm. Published in The Sacramento Bee on April 9, 2013. Carol Rodrigues Davidson, 68, died Sunday, January 15, 2012 at Hartford's St Francis Hospital due to complications from cancer. Born April 21, 1943 in Sacramento, CA, she lived in Wilmington, NC, and Miami, FL, before moving to the Hartford area in 1994 to be married to her husband, Bruce Robbins. She is preceded in death by her parents Carl and Barbara Rodrigues and brother Douglas Rodrigues. She is survived by her son David Gilbert and his wife Kellie, daughter Kathleen Gilbert, grandchildren Olivia and Wesley Kendall, and sister, Linda Wolfe, as well as her husband Bruce Robbins and his children Jeffrey, Neil and Timothy and their families. Carol was an artist and a patron of the arts. She earned her BFA at Florida International University at age 50, majoring in glass blowing. She worked in stained glass, glass etching, jewelry design and watercolor. She was proud to be a member of the Connecticut Watercolor Society. An active Unitarian Universalist, Carol will be missed by her UU Women's Group. She was an avid reader and could often be found after Sunday services overseeing the used book sale table she started. Carol served as president of the board of UU Rowe Camp and Conference Center in the Berkshires and leaves many friends in the extended church community. A memorial service will be held at the Unitarian Society of Hartford, 50 Bloomfield Ave, Hartford on Saturday January 21st at 1:30 pm with a reception to follow at the church. The family suggests memorial gifts may be made to Rowe Camp & Conference Center, Kings Highway, Rowe, MA 01367 or the West Hartford Art League, 37 Buena Vista Rd, West Hartford, CT.
Of Sacramento on September 3, 2002. Beloved father of Ellen Wick, John Boyd, and Rachel Boyd. Loving son of Lester and Margaret Boyd. Dear brother of Don Boyd. A native of Sacramento, age 59 years. Bob retired from the Army National Guard after 30 years. Friends are welcome for visitations from 4:00 to 8:00 PM on Monday (tomorrow) at Lombard & Company. Private inturnment. Age 59, left us on December 17, 2002. He died of pancreatic and liver cancer at the VA Medical Center with his wife Evelyn Pineda Bramlette and son Melvin Vincent Bramlette at his bedside. He is also survived by his granddaughter Mikaila Jade, stepson Andrew Gaerlan, his step-granddaughter Victoria Gaerlan, in-laws Pedro and Grace Pineda, his brother Ralph Goodell III, his sis-in-law Geri, niece Stephanie Bolton, grand-nephew Christian, and another little one due in June ’03, brother-in-law George Pineda, his wife Michelle and their two children Teryssa and Emilee. He is surely missed by all family and friends that really knew him. He received a Purple Heart from the Vietnam War; a BS degree in 1971 from UC Berkeley. A memorial service will be held this Saturday, January 11th at 2 PM. Hogan, Sullivan and Biano, 1266 9th Avenue, SF. Mr. Phillip Raymond Broughton, 62, passed away on Tuesday, August 9, 2005, at Yuma Regional Medical Center. He was born on November 16, 1942, in Sacramento, California. Phil was an Army veteran who served in the Vietnam War. He then returned to school and graduated from the University of California, Chico. He retired from San Pasqual Unified School District in Winterhaven, CA, after teaching there for 31 years. He also taught history and geography at Arizona Western College as an associate faculty member. He will always be remembered for his love of family and friends. Phil was an avid supporter of Dancer’s Workshop and Kofa cheerleading, holding the honorary title of #1 Cheer Dad. He enjoyed history and classical music. Phil was a devoted husband and father whose greatest joy in life was his family. He will be missed by all who knew and loved him. He is survived by his loving wife of 26 years, Cynthia Broughton of Yuma; daughters, Alison Broughton of Mesa and Anna Broughton of Tucson; brothers, Gary Broughton of Red Bluff, CA, Tim Broughton of Sacramento, CA, and Mike Broughton of Sacramento, CA. He was blessed with one grandson, Logan Austin Curcio; and numerous nieces and nephews. He is preceded in death by his parents, Anna Broughton and Lewis Broughton. A memorial service will be held at Kammann Mortuary, Saturday, August 13, 2005 at 4 PM. In lieu of flowers, donations may be made to the Pancreatic Cancer Network, 2141 Rosecrans Avenue, Suite 7000, El Segundo, CA 90245. www.pancan.org. COLLINS, William “Bill” 56, of Honolulu died Saturday May 29, 1999 at home. He was born in Sacramento, Calif. He is survived by wife Leanne, parents William A. and Wilma, and brother Robert. Private scattering of ashes at sea. Donations suggested to the American Heart Association. Born December 4, 1943. Passed away peacefully at his home on July 21, 2006, surrounded by his loving family and friends at age 62. He led a courageous battle with cancer for 16 years. Beloved brother of Rosemarie Coffelt. Cherished friend and partner of Dr. Fred Hirshburg. Dear uncle to Tammy Medlock and Michael Castagna. Also survived by many aunts, uncles, and cousins. Jim was a pediatrician for UCD Medical Group until his battle with cancer forced him to leave his practice. Jim loved vacations and traveling and made many trips to other countries. He was a dedicated doctor who was loved by all the nurses and the staff members he worked with. Friends are invited to attend a viewing on Tuesday from 4:00 PM to 8:00 PM and a funeral service Wednesday at 10:00 AM both at Lombard & Co., Funeral Directors. Interment to follow at St. Mary’s Cemetery, Sacramento. Donations can be made in Jim’s name to Mercy Hospice. Passed away peacefully at home in Antioch after a tough battle with cancer. Tom leaves behind a wife of 25 years, Mary Ann; daughters, Stephanie, Leticia, Lori, and Michelle; grandchildren; nieces; and nephews. There will be a memorial service for Tom on Saturday, May 8, 2004 at 11 AM at the Carson Valley Inn in Minden, NV. HENDERSON, Fox Daniel, 51, builder, died Thursday. Memorial services 3 p.m. Wednesday, Tulsa Whisenhunt Funeral Home Chapel. Peter "Pa Pete" Palmer, age 67, of Pearcy, died, Friday, May 21, 2010. He was born on October 20, 1942 in Sacramento, California, the son of Pete Palmer and Olive Rodabush Palmer. He was preceded in death by his parents and two sisters, Barbara Palmer and Shirley Knight. He retired from Weyerhaeuser after 25 years. He is survived by his wife, Mary Palmer of Hot Springs; his son and daughter-in-law, Hugh and Cynthia Palmer of Warrensburg, Missouri; his daughter and son-in-law, Kathleen and Jimmy White of Pearcy; two brothers and one sister-in-law, Charles and Kathy Palmer and Gordon Palmer all of Sacramento, California; his sister, Linda Logesden of Sacramento, California; five grandchildren, Jacob Palmer and his wife, Emily, Ashley Corcoran and her husband, Joseph, Caitlyn Palmer, Karlyn White and Kandace White; several nieces and nephews; and a host of friends. Services will be held at 10:00 AM, Monday, May 24, 2010 in the Davis-Smith Funeral Home Chapel, Hot Springs with Rev. Duane White and Pastor Kathleen Griffin officiating. Interment will be in the Mazarn Chapel Cemetery under the direction of Davis-Smith Funeral Home, Hot Springs. Visitation will be held on Sunday, from 6:00 PM until 8:00 PM. Pallbearers will be Rich Schultz, Richie Schultz, Kerry Bartholomew, Ray Bartholomew, Doug KinCannon, Randy KinCannon, Steve Tankersley and Bob King. Honorary pallbearers will be his great-nephews. Memorials may be made to The Promise Foundation, c/o St. Joseph's Auxiliary, 300 Werner Street, Hot Springs, Arkansas 71913 or the Mazarn Chapel Cemetery Association, % Patricia Wacaster, 707 Mount Moriah Road, Bonnerdale, Arkansas 71933. Guest registry is at www.davis-smith.com. SinceGraduation: Worked as a Labor and Delivery Nurse for 21 years in Santa Cruz, CA and Retired to Gold Beach, OR. FavoriteMemory: Always being the upper classmen even though we started as Sophmores. I was engaged to a military man during my senior year, and we married shortly after graduation. We traveled throughout the US during his military career. We had 5 children; 4 boys and a girl. We were living in OKC, OK when he retired so that was our home until his death due to cancer in 1998. Since then I have lived in Texas and Phoenix, AZ and now I am back here in Oklahoma, hopefully to stay. I now have 11 grandchildren, 7 great-grandchildren and another due around Christmas time. Ramona Jean (Bramwell) Fogal, age 67. Ramona died on March 10, 2010, in Omaha, NE, at her daughter's home after a hard fought battle against lung cancer. Born in January 1943, and raised in Sacramento, CA, Ramona was a graduate of Encina High School, Class of 1961. Ramona retired from Pacific Bell as a Telecommunications Engineer after 25 years of dedicated service. Ramona is survived by her daughter Deborah, son-in-law Tony and granddaughter Amanda of Omaha, NE, son Sidney Jr. of Fair Oaks, CA, and grandson Timothy of Santa Cruz, CA. Ramona was preceded in death by her parents Donald & Dorothy Bramwell (2001) and sons Michael (1963) and Brian (1995).Services will be private as per family request. William Francis Wentzell died Feb. 26, 2003, at Alderson's Convalescent Hospital in Woodland. Born Nov. 27, 1943, in Mount Vernon, N.Y., he was 59 years old. He spent his adolescent years in New York, until his family moved to Sacramento in 1958. Wentzell graduated from Encina High School in 1961, attended American River College and transferred to Cal State Chico, where he earned his bachelor's degree in economics. He also attended McGeorge Law School. A resident of Davis for many years, he worked for more than 20 years at UC Davis as a library technician. He moved to Woodland in 1999. He was a lifetime member of Delta Sigma Pi, enjoyed military history and was an avid San Francisco Giants fan. He is survived by his brother, Thomas F. Wentzell of Fremont. Private family services were held, with burial at the Davis Cemetery. Arrangements were under the direction of the Davis Funeral Chapel. Hobbies: I am a silversmith and love woodworking, my wife and I also run a small animal rescue, helping those who cannot help themselves. Stories: I returned to Encina as the second law enforcement unit when a riot broke out and a fight ensued, I was on the news and it was strange being in the same hallways I used to walk as a student, and now as a Deputy Sheriff, not a good memory, but certainly interesting. Trivia: Only that at 66 I decided to pursue a doctorate. The old adage, never give up. BestFriends: Carol Davis Serena Perkins Heidi Weber. Doug has passed away in the home he loved that over looks the Puget Sound Narrows and the Warren Avenue bridge. Born in Sacremento California to Daryl & Roxie Booth. Doug served his country proudly in the United States Navy aboard the submarine SSN-669 "Seahorse". After his stay in the Navy,he married Linda Craft and lovingly raised 4 sons as his own Ron, Jim, Don and Bob Craft as a Mentor, Father and Friend. Doug ran for Mayor of Bremerton in the late 70s and was a city planner for Eugene, Or., and Stockton,Ca. Doug retired in Bremerton to be close to his family and friends. Doug was loved and will be missed by his brother Greg Brown,4 sons, 7 grandchildren and all of his friends near and far. Doug did not desire any formal service, but a celebration of his life will be planned for his friends and family. Neil Watson died at his home in Murieta North Oct. 12 after a two-year struggle with cancer. He was 65. A memorial service will be held at 10 a.m. Wednesday at St. Vincent de Paul Catholic Church on Cantova Way. A reception follows at the Rancho Murieta Country Club. Mr. Watson was a devoted family man and an avid golfer. He played golf almost every day before his illness, and belonged to the Senior Men’s and the Men’s golf groups at the club. Janet Watson says of her husband of 27 years, "He was a special man." all the women’s functions and Men’s Club Prospectors Tournament,” Janet Watson said. The only hole-in-one in Mr. Watson’s golfing career occurred on Hole 15 on the South Course. He didn’t win a car, but he did acquire the tee marker for the hole as a lasting memento after the club replaced the wood markers with natural rock. Mr. Watson was a Marine Corps veteran. In addition to his wife, Mr. Watson is survived by stepchildren Kelly Barr, Jay Corsby and Mark Corsby; eight grandchildren and two great-grandchildren. Died in his home October 12, 2008, after a long struggle with cancer. He is survived by his soul mate and wife Janet Watson. Neil was born in Reno, Nev., on September 4, 1943, and moved to Sacramento where he attended the local schools including the first graduating class of Encina followed by his graduation from Sac State where he was a proud member of Theta Chi. He was preceded by death by his brother Gary Watson. He will be missed by his devoted nephew Michael Watson and nieces Chris and Kate, a sister Claudia Shaw and her three children. He is sorely missed by his daughter Kelly Lynn Barr, her three daughters, Samantha Janeil McGrath, Alexa Marie Vaughan, and Bailey Lynn Barr. His son Jay Corsby and wife Mary, their children Meagan Elizabeth Paschane, Jessica Michelle Corsby and Brandon Richard Corsby, son Mark William Corsby and his two daughters Christine Anne Vicars and Caitlin Nicole Hood, two great-granddaughters Lauryn Elizabeth McGrath and Sienna Nicole Vicars. He was a proud member of the U.S. Marine Corp. Neil loved golf and will miss being out there with his buddies. Also leaving a hole in his life will be his fraternity brothers who were so giving with their love and support. Services to be held October 29 at 10:00 a.m. at St. Vincent de Paul, Rancho Murieta, with reception immediately following at Rancho Murieta Country Club. In lieu of flowers, please make donations to Kaiser Hospice. Melvin (Lee) Pratt, of Hidden Valley Lake, peacefully left this world on August 19, 2008 with his children and family by his side. Lee was to turn 65 in December. He was born in Oklahoma but called California home. Lee graduated in Sacramento with the first senior class of Encina High School. He served in the Navy for 8 years with one of those years spent in Vietnam. He received a Vietnam Service Medal and Navy Expert Pistol Shot Medal. After the Navy, he joined the California Highway Patrol where he received a Medal of Valor from former Governor Ronald Reagan. Lee served as a Highway Patrolman from 1969 to 1991 serving the Los Angeles, Concord and Napa communities. He was a baseball enthusiast and member of the Elks Lodge. Lee recently moved to Hidden Valley Lake to be close to his two children. He is survived by his children Carrieann and Gabriel Lopez, Charlie Pratt, grandson Dano Lopez, granddaughters Kristina and Coral Pratt, his ex-wife and life long friend Christine Pratt, his soul mate and best friend Jane Sullivan, sister Sandi and Mickey Jones, brother Ronald and Jody Caldas, brother Jim and Linda Caldas, niece Kim Vinayak and nephew JC Adams, his dearest friends Walt and Sue Lamb and Dennis and Faye Janson, and many great nieces and nephews. A celebration of Lee's life will be held on September 20th at 5:00 p.m. at the LifePointe Church of the Nazarene, 7200 Rio Linda Blvd., Rio Linda CA 95673. A spaghetti dinner will follow the services. The family has requested that in lieu of flowers, donations can be made to either: California-Hawaii Elks Major Project, Inc. (CHEMPI), 2933 Kalakaua Ave Honolulu, HI 96815; or California Highway Patrol 11-99 Foundation, 2244 North State College Boulevard, Fullerton, California 92831. Trivia: Am still alive after triple by-pass surgery. Friends: Paul Sax, Bill Greenly, Everyone! Susan has two children, one born today! Amy and Aaron are just getting started! Memorable_teachers: Coach McCormick because he cared! Bio: Attended A/R for a year then went to the University of Hawaii where I met my husband Jim. After he graduated we returned the mainland and married in 1964. Moved to San Barbara, Ca where Jim attended Brooks Institute of Photography. After graduation Jim accepted a position in Denver, Colo. In 1970 we started our family. In 1978 Jim accepted a job at the college in Eureka, Cal. In 1984 I went into real estate and then in 1987 landed a job as the Real Property Manager for the County of Humbolt. Jim and I retired in December of 2000, moving to Willows, Ca to be closer to my mother. When she passed away in 2004 we sold our home and traveled in our RV for 6 months before buying a home in the hill county of Texas. Friends: Karen Larkin, Nadine Lewis, Judi Richards, Kathy Zahn, Sue King, Pat Pamateer. Actually I had a lots of friends that I really enjoyed. I have only been able to stay in touch with Karen. We see each other once or twice a year. I keep in touch with my counsin Carolyn Reese Stinson. The boys both live in California and Kimberly lives in North Carolina. They are all wonderful and we love spending time with them. We have three great grandchildren. Favorite_memory: I think we all felt special being the first graduating class. I many favorite memories from Encina and I enjoyed the many friends I had. Sharon Darlene Fanslow, a teacher who reached out to students with special learning needs during almost four decades in the classroom, died Thursday. She was 63. She died in her Sacramento home after a two-year battle with ovarian cancer, said her husband, Hal Fanslow. Mrs. Fanslow graduated from college early and began teaching at age 21 in the Sacramento City Unified School District, said her sister, Kathy Spector. She also taught for several years in Bakersfield and spent most of her career at several schools in the San Juan Unified School District, including Mission Avenue and Mariemont elementary schools. "She loved children and always wanted to be around children," Spector said. "She always talked about getting such joy when you see even the smallest gain a child can make." Mrs. Fanslow devoted most of her career to students with learning disabilities, including special education. Patient and persevering, she focused attention on children in one-or-one settings and small groups, colleagues said. She also coordinated her lessons with other teachers of mainstreamed students. "Sharon always had a warm and caring heart," former Mariemont Principal Mary Tidwell said. "She cared so very much about children and how they could be successful in life if they could be successful in school." Mrs. Fanslow was a highly regarded teacher who received the San Juan district's "You Light the Way" award when she retired two years ago, her sister said. She also earned the respect of her students with a fair but disciplined approach and by reaching out to their families, friends said. "She was very firm and very loving," retired colleague Martoo Beermann said. "That's a very delicate balance, and she did it beautifully." Sharon Williams was born in 1944 in Sacramento to a homemaker mother and a father who worked on engines at what was to become Mather Air Force Base. Her parents also taught Sunday school at Lutheran Church of the Good Shepherd, where she served as deaconness as an adult. She graduated from Encina High School and in 1964 earned a bachelor's degree in education from what was then Sacramento State College. She also received a master's degree there and taught special education teachers at National University, Hal Fanslow said. She married her husband in 1995 after her previous marriage ended in divorce. Mrs. Fanslow enjoyed camping, gardening, reading and cooking, especially for family dinners and barbecues with friends, Spector said. She inspired others by her battle with cancer, living a year longer than doctors expected. "She faced cancer with courage and grace," Beermann said. "That, in a nutshell, is who Sharon was." Sharon Darlene Fanslow, born April 26, 1944, in Sacramento, passed away on Thursday, May 31, 2007, in her home while surrounded by her family. She leaves an enduring legacy of faith, hope, and love. Sharon, a loving wife, mother, and teacher, blessed us all with her wisdom, faith and knowledge. She bravely faced cancer with dignity and hope, and showed us all what it truly means to live life, until God ultimately healed her by taking her home. Sharon is survived by her husband Hal; her children Jana Young, Rob Morris, Andrew Morris, and Avery Fanslow; her two sisters, Kathy Spector and Nancy Nakao; and her mother Helen Morris. Sharon was in Encina High School, class of 1961, and graduated from Sac State in 1964 with her teaching credential. She taught 37 years, mostly in San Juan School District in elementary classrooms, special education, and as a resource teacher. She valued children and family above all. Friends are invited to a memorial service at Lutheran Church of the Good Shepherd, 1615 Morse Ave. at Arden, Sacramento, CA 95864, on Friday, June 8, at 4:00 PM, to celebrate her life. Donations in lieu of flowers may be sent to the National Ovarian Cancer Coalition, P.O. Box 2125, Fair Oaks, CA 95628. Published in the Sacramento Bee on 6/5/2007. and their children Luke and Chloe, and by his son Michael (Cherie) Downie of Roseville and their children Kyle, Rachael, and Nichole. Steve is also survived by his sisters Sally (Ken) Gifford of Redding, Terry (Gary) Odell of Tucson, and Nora (Jack) Stanfill of Sacramento, as well as brother-in-law Jim Haven of Sacramento and sister-in-law Judie (Paul) Wilson of Clayton, Calif., and many cousins, nieces, nephews, and friends. At his request there will be a private service. Memorials may be made to Placer County SPCA, Boys Club of America or to your favorite charity. Published in the Sacramento Bee on 11/17/2006. Occupation: Currently a VP of Marketing for and Insurance Marketing Orgainzation. Bio: After graduation, went to college in Japan, Sophia University, until 1963. Returned to Sacramento and graduated from Sac State in 1967, first mid-term graduating class then. Went into the Air Force through officer training school, became a 2nd Lt. Was a munitions officer for two years, went to Thailand in 1968, returned to USA and then went to pilot training, graduating in April of 1970, transitioned into C-130's and went back to VietNam from 1970-1971 and was awarded the Distinguished Flying Cross along with 8 Air Medals and others awards. Ran into Shaun Sullivan there, we were stationed at the same base and drank alot together. Was assigned to Germany in 1972 and flew over there until I got out of the Air Force in June of 1975. Met my wife there (she was the sister of a friend of mine) and we were married in Switzerland April 1974. Returned to Sacramento in 1975, ran a cocktail lounge with my folks until 1977 and then got into the insurance and securites business and stayed in that until 2003 when I left the sales game. Became a "certified golf instructor" and worked as an assistant golf pro and Varsity Golf Coach for Bella Vista High School. Officially retired in June of 2005. Unretired in February of 2006 to take current position. Trivia: Got into martial arts in my mid 40's and succeeded in achieving my Black Belt when I turned 50. And have been studying ever since. About 6 years ago I started playing music again but this time playing banjo, stand-up bass and guitar with a couple of bluegrass bands. I am still taking banjo lessons and play in jams a couple of times a week. Will also learn how to play mandolin in the future. Friends: Grew up with Wayne Johnson, Dave Sampson, Jerry Holland, Eugene Freeland. Hobbies: Martial arts, golf, playing music, boating, racing my Porsche, which I have had 15 over the years. Kids: Tyler J., 27 and Kerner J. 26. Both sons are auto mechanics here in Sacramento. Tyler is divorced and has two children, Halie and Isaiah. Kerner (KJ) was just married last June to his girlfriend of ten years. Grade_school: Went to Greer, Winterstein, and Starr King. Grade_school_friends: Hal Ostin, Richard Casanova, Gene Freeland, Dave Sampson, Jerry Holland, Wayne Johnson, Judy Gibbs, Sue Palermo, Sid Bowers, Jim Dill. senior english class. We also harrassed everyone in her class. Favorite_memory: Making many new friends after transferring from Bishop Armstrong in my senior year. Being on the track team my senior year and the memories and friendships developed from that team. Kids: my son kevin is a teacher, I also have a stepson ,jerry,who has been in the navy for the past 20 years. we have two grandsons who take up much of our time. ESTATE. JUST BEEN WORKING AND REDECORATING MY HOME. Friends: TONI GOMEZ, BONNIE HARVEY, MIMI CULBERTSON, JOAN SEITZ AND ALL THE GANG. HAD A BREIF CONTACT WITH THE RUSSELS A NUMBER OF YEARS AGO BUT HAVE SINCE LOST CONTACT WITH EVERYONE. Hobbies: I LOVE PAINTING, AND ALL FORMS OF ART. LOVE PHOTOGRAPHY TOO! I HAVE A VERY LARGE YARD WHICH CONSUMES MOST OF MY WEEKENDS AND ENERGY. ALL OF MY DAUGHTERS ARE MARRIED. THE 2ND AND 3RD CHILDREN HAVE BEEN SO KIND AS TO GIVE ME TWO GRANDCHILDREN AND 1 ON THE WAY. THE BABIES ARE THE LIGHT OF MY LIFE AND CAN'T SEEM TO GET ENOUGH PHOTOS OF THEM IN ACTION. IT'S WORTH EVERY MINUTE. Grade_school_friends: WE HAD MOVED AT THE END OF MY 8TH GRADE SO I DIDN'T MAINTAIN ANY FRIENDSHIPS FROM ELEMENTARY SCHOOL EXCEPT BONNIE AND JOHN HARVEY WHO ATTENDED THE SAME CHURCH AS I.
Memorable_teachers: MR. TRACY WHO TAUGHT DRIVERS ED AND HISTORY. HE WAS THE BEST. IN DRIVERS ED HE LET US GET COFFEE AND DONUTS AT A LITTLE SHOP, AND HE MADE YOU REALLY LIKE HISTORY. Story: JUST LIKE TO KNOW WHAT HAPPENED TO EVERYONE. HOPEFULLY I BEEN IN TOWN FOR THE NEXT REUNION. I ALWAYS SEEM TO BE OUT OF TOWN WHEN THEY OCCUR. celebration of her life on Sunday, June 27, at 3:00 PM at The Gathering Place, 3137 Taylor Road, Loomis, CA 95650. In lieu of flowers, the family asks that memorial contributions be made to the Scleroderma Foundation, 12 Kent Way, Suite 101, Byfield, MA 01922. Published in the Sacramento Bee from 6/19/2004 - 6/20/2004. Died suddenly at home in Oroville after a hard fought battle with Carcinoid. Lee was an accomplished artist, member of Sacramento Artist's Collaborative Gallery, and a graduate of Encino High and San Jose State University. Leaves wife, Cathy, sons Michael and Chris, mother Lucile, and sister Jennifer Stanley. Memorial will be held at a later date in Oroville. Will be very much missed. Published in the Sacramento Bee from 8/7/2003 - 8/9/2003. It is with deep sadness, I inform you of the death of Harold Ostin, a friend, classmate and incredible human being. Harold died Thursday, October 3th in Laguna Beach. He was 58 years old and had suffered from diabetes. A thoughtful, intelligent and strong-willed person, Harold was believed to be the oldest living childhood diabetic. Internment at Home of Peace in Sacramento was private. His son, Harold, Jr, daughter-in-law Diane and grandson, Michael Anthony, survives Harold. Acknowledgements can be sent to 28941 Drakes Bay, Laguna Nigel, CA 92677. Since Encina and Sacramento where always a special place to Harold, I'm planning a Remembrance in Sacramento. The details will be communicated as soon as they are finalized. Your input is appreciated by email (ddoerr@earthlink.net) or phone 775 772-9342. I left Burlington Ontario at the beginning of the 12th grade when my parents moved to California. I finished high school at Encina High School in Sacramento. I worked for an insurance company and they provided the education for me to become a computer programmer. I am still a programmer but the title these days is Senior Applications Programmer Analyst, which just means I am an old programmer. I got involved in sailing and that has been my major outdoor activity for over 30 years. I have been married to a really great guy for 20 years. He is a structural engineer. On one of our first date I took him sailing and fortunately for me, he loved it. Prior to my meeting him I had crewed on a boat through the South Pacific as far as New Zealand, and lived and worked there for a year and a half. Since we met I raced in the 1980 Pacific Cup Race from San Francisco to Hawaii and the 1987 Trans Pac from LA to Hawaii. We now have 2 sailboats. One is a Standfast 36, in which we completed a circumnavigation in the years 1988 to 1992. We now keep it in Hawaii for vacations. The other is a Merit 25 which we race in San Francisco Bay. We have 2 cats, a Tonkinese and a Rag Doll named Butch and Sundance. I still love music - I won the music award for my grade the three years I was in Burlington High - and I attend the San Francisco Opera frequently. I love to sew and do beading and make most of my own clothes and jewelery. I enjoy entertaining and love to cook. Basicly I enjoy my life. It has turned out to be totally different than I ever thought it would, but it has been fun. I am in good health and look forward to many more years of sailing and traveling whenever I can. I hope anyone who might read this is feeling great and enjoing their life to it's fullest. Bio: After Encina, I went to the U of A, got married, finally graduated from San Jose State. Worked for a CPA firm, then started my own firm in Fremont, CA. My husband took a transfer to Chicago in '86 (great move, getting the kids out of California) so, I sold my firm, took a year off then went to work for another firm. Tried a buyout with another partner which fell through so we started another firm and acquired a couple of other small firms. My Husband's company sold (he fixes distressed ins cos)and he retired so, I sold out my partnership. This was in '97. We shipped our belongings to Arizona but, before we could get there he took a job in Florida. We were in Sarasota 22 mos (didn't like Forida). He retired again, this time for 8 mos in Arizona (he needs a hobby) and he took a job in Dallas, where we have been for the last 2 years. We love the "Big D" but, we live too far away from the kids and grandkids. I have been married to this same wonderful man for 35 years. Trivia: What? You want interesting trivia from an accountant? Friends: Best friends in high school at Encina? Karen Larkin, Sharon Vranesh and Judy Richards. Lost contact with all of them many years ago but found Judy here in Texas about two hours away from me! I also spent a lot of time with kids from El Camino whom I grew up with and who lived near me. Hobbies: I golf, read, take classes at SMU and vounteer my time teaching reading to children for whom English is a second language. Also, co-host a group which teaches women about finances. Love to travel! Kids: Three wonderful daughters! Tara, the oldest, reinsurance co exec, currently at home with my sweet granddaughter, SaraGrace, 2 yrs old. Daughter Jennifer, a twin, Professor in biochemistry and does immunology research, has my beautiful granddaughter, Clare, 3 yrs old. Daughter Heather, the other twin, an NMD in practice with a medical group, has my wonderful grandson Austin, 6 yrs old. Grade_school: Arden and Winterstein were the grade schools I attended. Grade_school_friends: Grade school friends who went to Encina were Judy Richards, Christine and John Landgraf. Used to take ice skating lessons with Karen Schwartz. Everyone else went to El Camino, Barbara Hill and Kathy Farrell were the two I spent most of my time with. Junior_high: Starr King was my junior High and my first introduction to most of the kids I went to Encina with. Junior_high_friends: Friends from junior High? Still Barbara and Kathy. Kathy and I hung out at Arden Hills CC. Oh, Diane Tellman lived across the street from me. I remember Marcia Betow's great slumber parties with Joan Seitz, Ardenkaye, Judy Richards and others. Afraid I'm getting too senior to remember other names. Memorable_teachers: Most memorable teachers were Mrs. deGooyer who was very insightful and who gave me a sense of who I could become. Mr. Tracy whose teaching style was different but, I learned history. Oh, Can't remember his name but a great English teacher who was tall, balding and had a fabulous sense of wit and humor. Anyone recall his name? Award-winning filmmaker Ed Tis shot Rainier Beer commercials Walter Edward "Ed" Tis, the Emmy-winning Seattle film editor and television cameraman who shot the Rainier Beer commercials starring a bullfrog chorus and a brand-name-spouting motorcycle, faced life like the sailor he was at heart. He saw it as an unfolding horizon to be explored for fun and profit. Awash with ideas for pranks as well as for perfectly crafted film segments, he mastered the camera as he once had mastered racing yachts and motorcycles. When he "retired" in 1991 to become the skipper of seafood-tending vessels in the Bering Sea, spending summers working with his son, he was happy to pass his knowledge and joy to the next generation. Mr. Tis died Sunday (Nov. 28) of lung cancer. He was 56. "He was such a colorful person," said Linda Tis of Kirkland, his second wife, to whom he was married 27 years. "He always stopped if someone needed help. He did a lot of things and knew a lot of people." Born in Richmond, Calif., he developed an early love for boats and football. He graduated from high school in Sacramento, worked briefly at a television station in Sacramento while attending community college, then won a football scholarship to the University of California, Davis. He played second-string tight end in a semi-pro football league and also played for the Canadian Football League's Ottawa Rough Riders. A rib injury ended his sports career. Mr. Tis worked as a photographer in San Francisco, raced motorcycles and crewed on trans-Pacific yachts before being invited to join a Seattle crew traveling to the former Soviet Union to film a documentary. 1974 for the KING documentary, "Pompeii on Elliott Bay." In the late 1970s, he had his own filmmaking agency, Filmmakers. He was hired to shoot the Rainier commercials for the Heckler Bowker ad agency. Mr. Tis contributed ideas to many ads, but specifically came up with footage of a friend running through gears on a motorcycle to the sound of "Raaaii Nieeer Beeeer." In 1981, when videotape became the norm for TV, Mr. Tis left the industry; he felt video was flat, said his wife. He lived in California, ran vending machines and built cranes. But in 1991, he returned to Seattle and the sea. "His greatest love was the sea," his wife said. "He was only 56, but he lived two lifetimes. He didn't say no to anything." Also surviving are his children Jason Tis and Romy Tis, both of Kirkland; Michelle Braduch and Jennifer Gonzales, both of Burns, Ore.; and Steve Tis, Vacaville, Calif.; sister Elizabeth Sleeth, San Jose, Calif.; and six grandchildren. Donations may go to the Ed Tis Memorial Fund, c/o U.S. Bank Juanita office, 13233 100th Ave. N.E., Kirkland, WA 98034. Born February 13, 1943 in Sacramento, CA. Ken lost his battle with heart disease and died suddenly May 19, 2001 in Glendora,CA. At his side were Rosemary Schnaidt, his loving partner of 16 years and dear friends, Ed & Joyce. Ken is survived by his beloved children, son Jim Schnaidt and wife Randy of Utah, daughter Brenda Garcia and husband Fred of Texas, and son Karl Schnaidt of Sacramneto, with all of whom he shared a very special relationship. He also leaves his stepson, Mark Seagren and wife Donna of Florida. Loving Grandfather to three grandsons, Nathan, Dustin (Dusty) and Joshua and four granddaughters, Brittany, Melissa, Danielle and Michelle. He was preceded in death by his mother, Helen. Also survived by father, Alvin Schnaidt, sister Carol Klein and husband John of Sacramento and dear sister Diane Gibson and hsuband Dave of Olympia. Uncle to Rev. Darren Klein, Bonnie Bassett, Greg Klein, Amy Berkebile and David Gilbson, as well as their spouses and children. Also survived by his aunt, Frances Hansen and his uncle, Fred Miller, both of Sacramento. Ken was employed at Pacific Bell for many years and later established his own company, Eagle Communications. He shared his love of fishing, traveling, and "bussing" with Rosemary and Karl. Ken had a true "zest for life" and a talent for making many friends along his life's journeys. Kenny will be missed dearly by his friends and family. All family and friends are invited to a celebration of Ken's life at a memorial service to be held in his boyhood church, Trinity United Methodist Church, 2245 Highridge Drive, Sacramento, Sunday, May 27, 2001 at 3 PM. Gifts in Ken's memory may be given to: American Heart Association, 2007 O Street, Sacramento, CA. Designate "in memory of Ken Schnaidt". Bio: Best part of the year following graduation spent at ARC, then moved to Fresno, attended Fresno State for two years, then moved back to Sacramento and (finally) graduated from Sac State in 1967. Immediately went to NAM -- 13 months. Lived in Chico most of the 70's, worked in sales then mid-management, then moved to Seattle through 1986. Was transferred to Omaha (culture shock) in 1987, then to New York (more culture shock) in 1999, where I am today. I manage marketing activities for a moderately large chemical manufacturing firm (not the nasty stuff -- we are the good guys). Have 3 children and 4 grandchildren. Trivia: Highly involved in environmental issues. Spend a fair amount of time in Washington DC schmoozing with various agencies & polititions. Hobbies: Hobbies & therapy activities -- Photography, gardening (why does everyone do this when they get older --?? ), computers,reading. Don't watch TV hardly at all. My friends think this is quite strange. Kids: All three of my children are happy & healthy. Daughter Deanna lives in Yakima and is a homemaker, daughter Danette lives in Rutherford (Napa Valley) and owns a successful landscaping design business (she will be the one to support me in my old age) and my son Matt lives in Chico and owns a carpet cleaning company. Favorite_memory: My favorite memory? -- The Model A Ford I owned and the envy it created. Paid $30 for it and sold it for $90. Bio:Did one semester at ARJC then joined Army. Served 3 years in San Antonio,TX. Moved back to New Jersey in 1965. Spent 3 years in NJ National Guard where I met my husband Bill. We moved to Pennsylvania in 1979. I began work for the state in 1985 and am still working. Trivia:Have 3 children and 5 grandkids(Keith, Mark, Luke, Lisa, and Caleb). Have been active in church and community organizations as kids grew up. (Scouts, band boosters, little league, community pool, to name a few. )Lived in Teaxas, North Carolina, New Jersey and Pennsylvania. Friends:Barbara Crane, Ellen Hilton, Mara Holmes, Michele Lyons, Herb Bramlett, Jimmy Cuilla, Chris Kopf, Barb Rumsey, Judy Blackburn, Genevieve Hoyle, Mike Pascoe, Wayne Singer. Lost contact with all. Hobbies: Like to travel, camp, hike, bike, spend time with grandkids and special friends, and enjoy music. Kids: Like to travel, camp, hike, bike, spend time with grandkids and special friends, and enjoy music. Memorable Teachers: "Coach" Michaelson for all the fun in PE and GAA. Robert Hilmoe for his unique way of teaching and rersearch trips to UC Davis. Jack Carey for many memorable events from chorus performances and classes and most of all for his wonderful friendship both to myself and my aunt through the years. Favorite Memory:The entire senior year but especially Senior Hat Day and our boycott on the Senior Lawn. Doing stats at trackmeets for Mr. Stephens. Cheering for Chris Kopf and Rudy Minnick at basketball games. Senior class picnic and all night grad party. Marital Status: Widowed. My husband William died in 1990. Wayne Richard Johnson visited Yosemite National Park often in hopes of duplicating Ansel Adams' famous photograph of Half Dome. "He tried and tried, until he decided it was fake!" his wife, Linda, said with a smile. "He photographed Yosemite every chance he got. He felt his soul was there." A scaffolding expert and businessman, Mr. Johnson died in Sacramento of an aneurysm on Tuesday at age 53. Upon graduation at Encina High School in 1961, he founded the Johnson Scaffolding and High Reach Equipment company -- which grew to employ more than 300 people. In 1988, he sold the company but continued running it for three years. Most recently he was president of Performance Swing Stage. "He would call with advice about life in general, about business, about everything," said his son David. "I learned more from him than anyone else. Business was his life. He was admired and respected . . . quiet and very dedicated to his family. He wanted to be the best at everything. In Sacramento on August 13, 1995. Beloved wife of Victor Guidera, loving mother of Brian and Charles Moore and daughter of John H. Skinner, stepmother of Len, Shannon, Missy and Matt Guidera, dear sister of Penny Hancock-Glaizel and John Skinner. Born in Alameda, CA, on December 8, 1943, Lynn resided in Sacramento for over 35 years. Lynn was employed by UCDMC for over 9 years and was naturally suited to her career as a licensed clinical social worker. Her innate ability to counsel others along with her compassion for those in need was reflected by the love, admiration and respect from all that knew her. Bio:Left Sacramento in the late '70s and moved to the Bay Area and after a year there I met a retired Coast Guard Master Chief and we married in Hawaii. Came back to Bay Area and got a pop top camper and went all over the US, would take too long to describe that trip. Then moved to Hawaii for two years, came back to Sacto for six months and then moved to Maine where my husband is from. After I left Encina to get married in 1960, (would have graduated in 61) I married Don Moore who was two yrs older and had gone to El Camino. After 13 yrs, we divorced.I had 2 children with him. a daughter Laurie 38 and a son James 36. I have 8 grandchildren. My daughter lives in Buffalo New York and my son now lives in Chico, Calif. I am happy here in Maine and don't particuraly miss Calif.
Bio:Nam ! ...then Films ...then......... International Development 1st in Europe - then Pacific rim - now S.E.Asia. Involved with developing manufacturing, export and import development in Thailand, Singapore, Hong Kong, Taiwan. Our firm develops, advises potential manufacturing,travel related facilities, through IPPO's. I've just married a lovely Thai Lady (a year 1/2 ago) We have a wonderful 9 month old son. And I've just been busy. I'm about to slow down but NOT retire. Trivia: Been involved with motion picture business and moved on to my current business interests. Friends: Kenny Strong .... There was a great guy. Sure wish I could meet him again. Hobbies: Hunting in U.S. and Africa (When I can get away for a couple of weeks). Enjoying fine dining, good wine, real friends, and loafing. Kids: Our Son???? He's only 9 months old. But smart as a whip, is walking and getting his first teeth. I just hope he can handle speaking both Thai ( my wife is Thai) AND English. It will be interesting....and will we have the time of our lives ( I know I will, taking him everywhere with me...showing him the wonders of this world). Grade School: ~~>...LOL...<~~~My son will be taught privately. Memorable Teachers: Mr. Steinagle...There was a TEACHER ! A Frenchman I don't recall his name,I wish someone could tell me???? There was a biology teacher, very funny...I forgot his name too. The others ...... very forgettable. Favorite Memory: Just that it WAS a REAL school..THEN ! Favorite Memory: I really enjoyed being the first graduating class of Encina. I was small for my age and immature (still am) and I think the status of being a member of the senior class for three full years made those years much easier than they otherwise might have been. Heard About Website From: I think someone spammed me with it!!! Bio:Worked for the Franchise Tax Board for 3 years. Moved back to Southern CA in 1964. Worked for Burroughs Corp (now Unisis) for 3 years. Met my future husband in 1967; married in NC in 1968; moved to MI where we've been ever since. Trivia: I'm an absolute "Snoopy" addict. Friends: Jill Frost, Carol Fuchs, Shirley McDowell, Maureen Gallagher, Jeri Hendrix, Loretta Litau. Kids: Two daughters: Charra, 23, who is in her last semester at Eastern Mich. Univ. majoring in Film and Telecommunications; Carla, 20, who left college after her sophomore year to work full time and save money so she can move to CA and attend the Westmore Academy in Burbank and learn to do movie makeup. Bio:I joined the Air Force as a fresh faced (remember?) 17 year old in June 1961. Spent three years in Scotland as a radio intercept operator. Returned to Sacramento and went to work at McClellan Air Force Base for the next 29 years, retiring as a mid-level manager in 1994. Spent several years playing golf and traveling. I now work part time for United Airlines and get to travel a lot for almost nothing. Trivia: I married Donna from Logan Utah in 1983. At the time I was a single parent and we've had a wonderful 16 years together. We now baby-sit our grand daughter several days a week and generally live "the life of riley" (old tv show). I play golf and the stock market and am trying make it to all the major league baseball parks in the U.S.
Friends: Best friends were my brother Lyle and Norm Burster, both the class of '62. High school sweetheart was Barbara Ford, class of '64. Kids: Lonnie, our son, is 32 and lives and works in Sacramento at a company, Blue Collar Warehouse. He's married and has beautiful 4 year old daughter, Brooke, and another child on the way. Jill, our daughter is 29 and lives in Medford, OR where she's a manager for Lithia Motors. Grade school friends: Best friends from grade school were Jim Alley, John Russell, Paul Warner, Jay McIntire, Carol (Mills) Russell. It's especially good to see them at our high school reunions. Story: I took a college class seven years after I graduated from Encina and the professor, an ex-Encinian Mr. Tracey, was calling Roll on the first day of class. When he came to student "Ralph Jacobson" he never looked up when I answered "here." He merely said, "Encina, Class of '61, right?" I guess we (probably with some of your help) made quite an impression. He went on to tell my college class that our class, the Class of '61, was most memorable. Bio:4 yrs Air Force, 16 yrs U.S.Post Officem owned skating rink for short time. 14 yrs at current job. Coached and umpired kids baseball for 20 yrs. I know some of you met my wife Bunny when we lived in Sacto after I got out of the Air Force. She's a lovely lady and we've been married 35 years. Bunny works as a financial secretary for a middle school in the same school district where I work. She's in her 20th year there, and someday I guess we will graduate and retire. Trivia: Lost most of my hair. Kids: Oldest is Jason, 30 yrs old. Works as customer svc supervisor for insurance company in Salt Lake City, Ut. Has two handsome intelligent sons,Daylon 4 and Dahlton 2. Youngest son Jared is 25. Works for medical products company in Salt Lake City, Ut. Bio: As most everyone I attended a few classes at ARJC, off to the Navy for 8 years (including duty at GtmoBay Cuba during the crisis and VietNam). Left the Navy uniform hanging to spend 22 years in a California Highway Patrol uniform (retired from the Napa Office in 1993) and now work for the Department of Education in Sacto. Trivia: Was presented the Medal Of Valor from Ronald Reagan in 1971. Friends: Tom Gardner, Dotte Smith, John and Carol Russell (who I enjoyed working with on our 30th reunion committe) and just reunited with Kathie Rayfuse ('63) online. Grade school: Arden, Cottage, Greer, Winterstein, are there any left? Junior High: Did we have JR high school? Trivia: I married a musician who had a hit record "I love you more today than yesterday" The Spiral Staircase. married 16 years. Rough life though. I'm the God Mother of Ardenkaye Allison's daughter, Shelly Stokes, and Shelly is the catcher on the Olympic gold medal winners of the womens softball team! Friends: Ardenkaye Allison, Lynn Skinner, Jill Frost, Candace Voorhees, Don Pauley. I see Ardenkaye all the time. Lynn has passed away. I would love to find Jill. Don comes around every now and again. I see Carol (Mills) and John Russel. Joan Seits and Dave Haynes are close friends now. Alumni in Contact: Joanie Seits, Dave Haynes, Ardenkaye Allison, Carol Mills, John Russell,Tom Matthews (wife Jan), Molly Culberson, Jack Emerson, Nancy Benveuti. I see lots of others from time to time. Basically....We went from being Dyer Kelly HummBugs, to OrangeGrove BummbleBees, to Encina Apaches. After High School, like other '61ers, I went to American River Junior College, where I had a fun-filled year and at its conclusion, received a letter informing me that I appeared to be not the type of student they were looking for.....soooo, Jim Alley (who I believe got a similar letter) and I joined "The Aero-Space Team" better known as the US Air Force. Texas, Mississippi, Montana & Alaska led to the belief that I should try it in Civilian Life. Went to work for Pacific Telephone in 1966, met a teen-ager named Michele and we got married that same year. We have two grown children. Sean who is 32 lives in San Diego (Coached College Rowing for a while and now works for Union Bank) and Tina, 28, is married to D.J. Johnson. D.J. & Tina made us Grandparents this year to the most beautiful Twin little girls you have ever seen. Prior to the births, Tina worked for "the State" in the Department of Conservation, Div of Oil & Gas. All things being equal, we hope she can stay home and raise Isabelle & Elizabeth. Bio: Working in the medical field, traveling a bit and playing golf whenever I can. Trivia: Was one of the first few women in California to be allowed to show in cutting horse competitions (1967). Friends: Mary Gawlik Meyers (now Adams), Carol Rodrigues Davidson, Edith Shellback, Joan Capra. Hobbies: Golf, reading, quiet time at Lake Tahoe and Guerneville. Kids: Two step daughters, three grand children,.all well adjusted and healthy. Grade school friends: Same group as above, as well as Pete Gebauer, Kermit Paul, Wayne Luth, Lanny Linville, Bobby Ballard, and others I cannot remember right off hand, but can see their faces in my mind. Favorite teachers: Mr. Coke above all the rest. Such a kind man, even when I almost burned up the room during an experiment - always encouraging and supportive. I have never forgotten him.